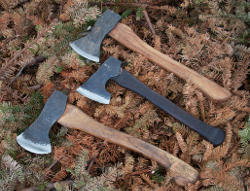 Come explore the ancient craft of the hand-forged axe. 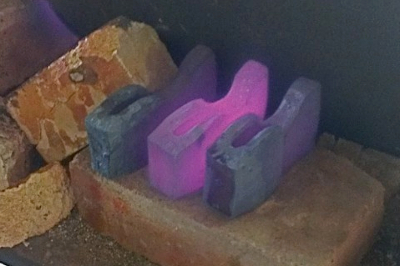 In this workshop you will learn a number of techniques including; axe design, basic metallurgy and steel selection, tooling, forging and working with a striker, heat treating, and hafting a handle. 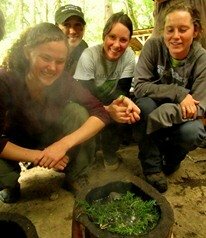 We combine these skills to produce a small camp axe which you can take on your next outdoor venture. Come prepared to work hard and have a great time! Cotton clothing is a must, and leather shoes are recommended. Ear and eye protection is required. Basic forging knowledge is helpful but not necessary. David Tuthill has been working with metals, beginning with jewelry, since the age of fifteen. He began forging as part of a sculpture course at Santa Barbara City College in 1988. He did not begin forging full-time until 1992 when he began to do privately commissioned work. Predominantly self-taught, he has been constantly challenging himself to further his skills by taking on tasks, or designing jobs that force him to learn something new. 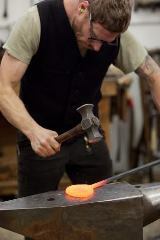 He has been operating his business, FIRE HORSE FORGE in the Ballard neighborhood of Seattle since 1994, where he produces architectural commissions, as well as furniture, sculpture, and jewelry. David’s years in the Northwest have been the most formative in his metalworking career. With his love for the outdoors, being surrounded by the vast and expansive nature of the region, as well as a rich industrial history, including timber, maritime trades, and railroads, he has continued to learn and has been able to more fully appreciate and understand how the influence of his surroundings can be reflected in the pieces that he produces. “For most of my life I have been interested in history, and how it still directly, and indirectly influences us today.” “There is a connection to many of the traditions that brought us to where we are standing, so how do we give these ancient sensibilities, a modern voice, how do we relate it to now?” Learn more about David Tuthill at his website, https://www.firehorseforge.co.